Santorini. What to say about this place?! It is one of the most unique and special islands in the world!! Here you will find 21 of the best things to do in Santorini! 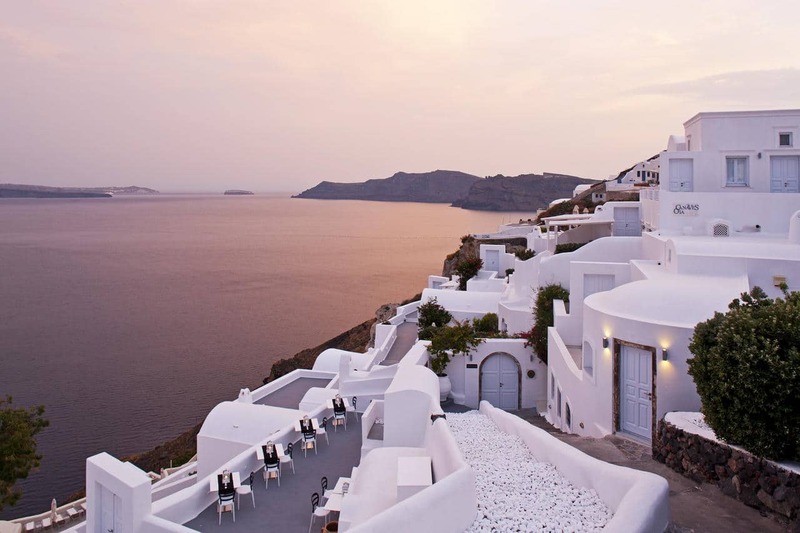 What a better way to start the list with the best things to do in Santorini than the worldwide famous sunset from Oia? Here there is no secret! Just find a nice spot (alert: it gets very crowded!) and just relax to enjoy this fabulous sunset! If you want to skip the crowds in Oia and enjoy the sunset you can select the boat tours. 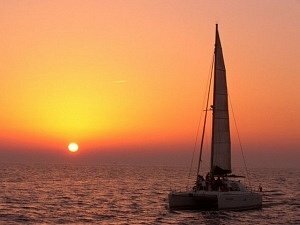 A simple and affordable tour is Santorini: Volcanic Sunset Cruise. 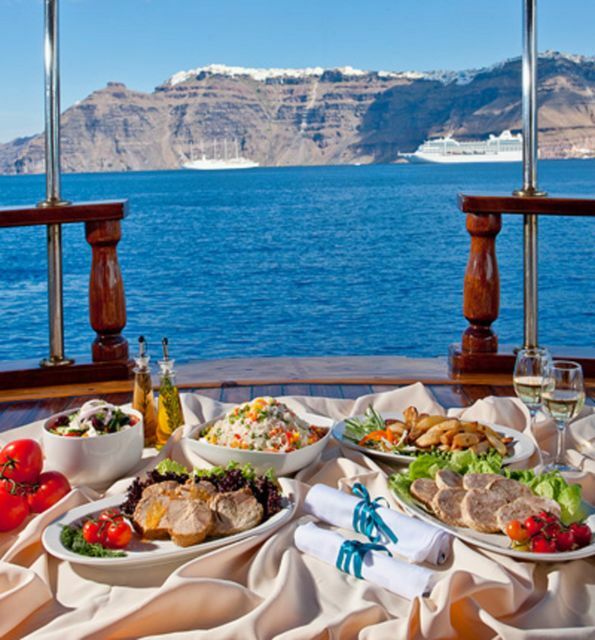 Now if you want to include dinner and drinks then the DreamCatcher Sunset Sailing Cruise in the Caldera would be ideal for you! It even included a pick up from your hotel. Let’s be honest. 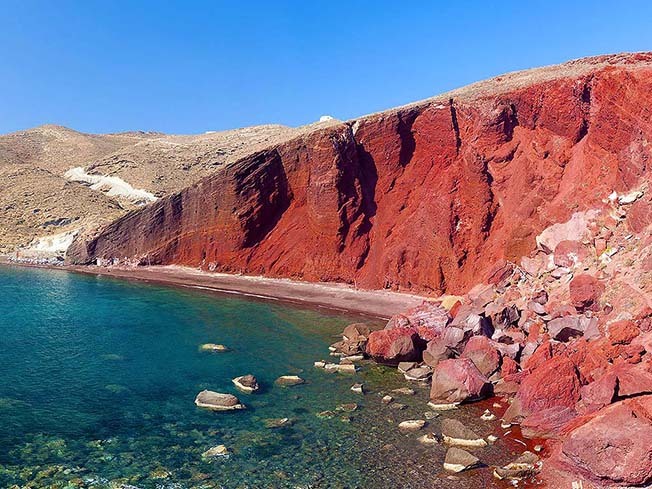 What makes Santorini unique and are not the good beaches, the nightlife, the excellent restaurants and the remarkable wines, but it is the volcano that makes all the difference and has created this dramatic scenery and formed this special island! So, you can get the Santorini Volcano and Thirassia Sunset Dinner Cruise, if you want to cruise around the island an get some free time at Nea Kameni volcano. with a dive in the springs, and watch the sunset over the island on a dinner cruise. If you prefer a smaller group then this tour would take you around the volcano, the hot springs, the old Venetian lighthouse and the White and Red Beach with lunch served and cocktails. This is a trail of around 10 km and you might need 3-4 hours to complete it. It is quite easy to follow the trail, but I attach the below route that you can follow. Quickly the starting point is the Archeological Centre in Fira and then you head northwest to Firostefani. 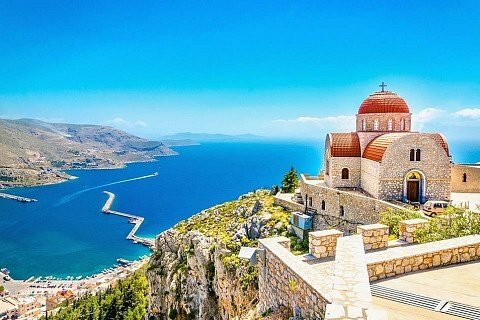 Walk towards Firostefani and after passing by Saint Nicholas, you will continue through Imerovigli and you will see the famous Skaros rock. You can take a break at the chapel of Saint Antony or Prophet Elias before reaching the picturesque Oia. The ancient settlement was destroyed during the Theran eruption in the 16th century BC and buried in volcanic ash, which preserved the remains of fine frescoes and many objects and artworks! Personally, I think this is the most important archaeological site in Santorini, so if you have some time just put it on your schedule. There is also a very interesting tour guide that shows you around and informs you about the history of the island, the eruption, and etc. 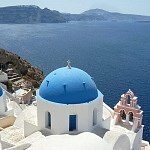 Santorini has one of the best and unique wines and consequently has plenty of great wineries! You start your visits from the Wine Museum Koutsogiannopoulos and continue to the other 15 wineries! If you want the best view the, then Santo Wines should be your only choice and if you want something quiet then Domaine Sigalas is the best choice. 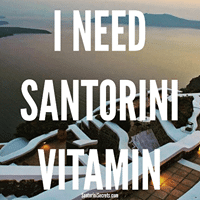 Personally, I prefer a new recent entry in Santorini wineries, which is Valsatis Vineyards. Of course, you can select one of the tours and visit more wineries. 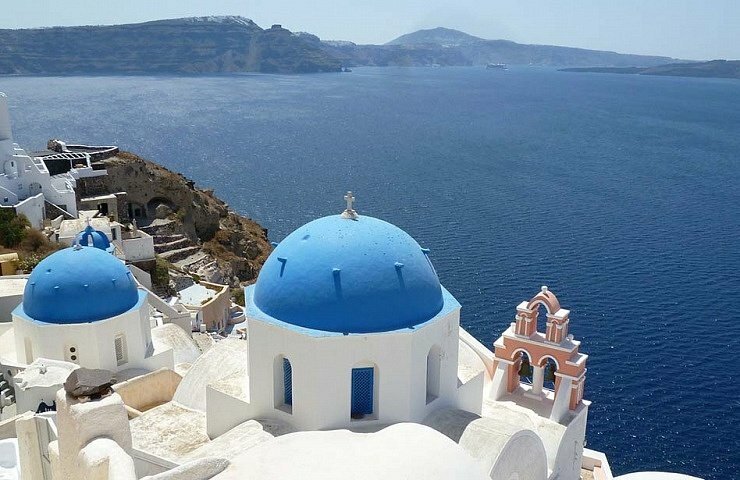 The most popular option should be to get the Santorini Half-Day Wine Adventure Tour, where you will visit 3 different wineries and try up to 12 different wines! 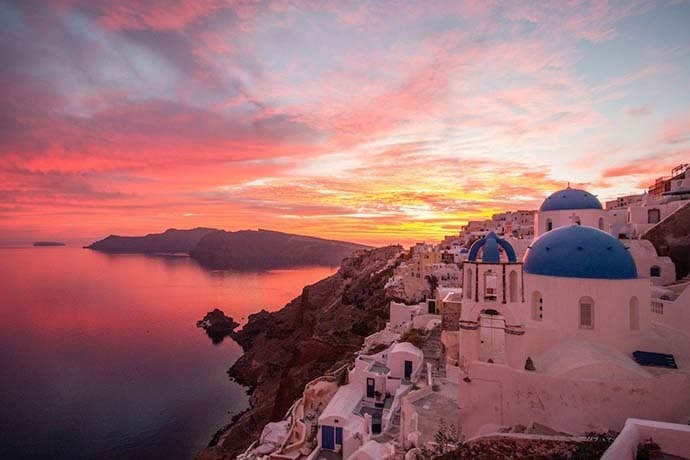 Now if you want to combine wine tasting and the sunset, then you should get the Santorini: 4-Hour Sunset Wine Tour! This is a must-see for the lovers of art and history! With the tour around the historical Tomato Paste Factory, you will get a piece of understanding of previous decades economy and social aspects of Santorini! Amazing concerts and events during summer. An extra plus; It is y situated to one of the best beaches: Vlychada! Santorini might not have the best beaches in Greece, but has some of the most unique. One of them is Red Beach. It is located down the road from the Akrotiri and you have to walk 10-15 minutes from the car park or the bus stop. Be careful, because often it is closed because of the falling rocks. Greek food can be really amazing. Imagine now, not only eating but also preparing it and learning all the techniques! Most of the tours about cooking are quite nice and entertaining. If you want to combine food with wine tasting, I think the best one is the Santorini Cooking Class and Wine-Tasting Tour. 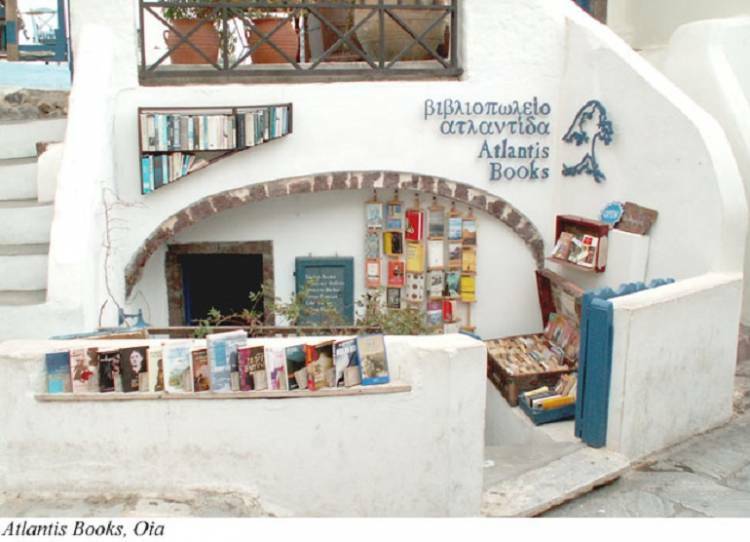 While you are walking in Oia, you cannot miss Atlantis Bookshop, an independent bookstore that has been featured at The New York Times and Vanity Fair. It has been called one of the best 10 bookshops in the world! A really and unique little gem that every book lover shouldn’t miss! 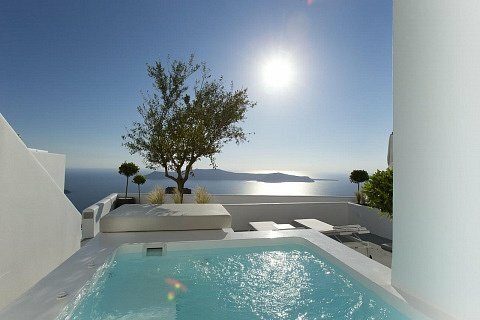 Santorini has some magnificent and absolutely romantic hotels that you will never forget! They are on the pricey side but they are simply unique and special. 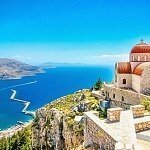 I gathered here the best places that you can stay in Santorini, with detailed information, photos and map! 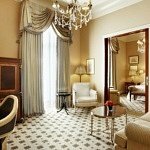 If you are a photographer lover then this tour would absolutely fit you! If you are not, then you should also consider especially due to Olaf the photographer! He is just the top on what he is doing and he will take you off the beaten path and guide you at every step on how you will get amazing photos! Truly highly recommended! 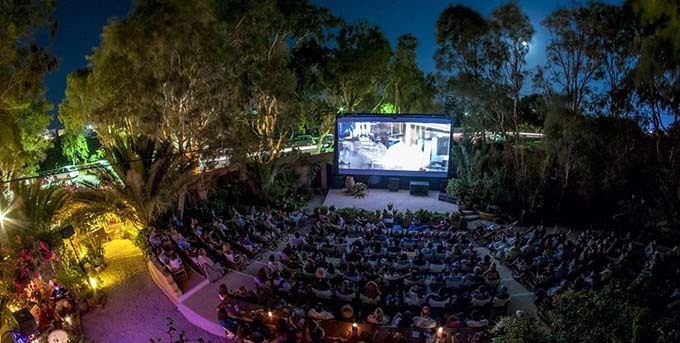 This is one of my favourite open cinemas in Greece! From May to September this lovely cinema opens its door and it waits for you for relaxed summer nights! A small tip: At the back of the cinema there is a small bar, so you can get your drink during the break or before the movie! There is a small bar at the back of the cinema and each movie has a short break in the middle so you can get your next drink! The movies usually start around 9:30 pm (check here the official site), but it is better to be there at 8.30 when the doors open to make sure that you find a seat! Across the street, there is a bus stop that it will take you back to Fira. Just check the schedule when you get there to ensure that there is a bus after the movie (usually there is one)! These are actually the same long beach and probably the best beaches in Santorini with black sand! 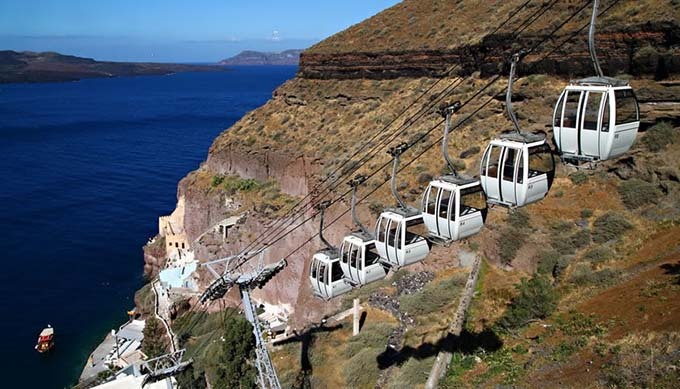 They are about a 30-minute drive from Fira and 45 minutes from Oia. There are lots of beach bars, tavernas, pizzerias and cafe options for you to basically spend the whole day. The best bar probably is Tranquillo and if you are looking for a Family friendly bar then Terra Nera is a nice choice. 15. Drink one local beer or more! Santorini has amazing wine but also it makes unique beers. You can try local beer Volkan, which is quite special as due to the salty water of the island, a lava filter is used. Also, a must try is the “Donkey” beers. There are 3 different types: Yellow Donkey (golden ale), Red Donkey (amber ale) and Crazy Donkey (IPA). If you are a real beer fun then you can visit the local Donkey brewery. More details here! 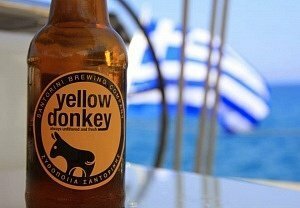 I have also posted a full list of Greek beers here! I find this tour very interesting and entertaining. You will learn some different traditional fishing techniques in lovely scenery. 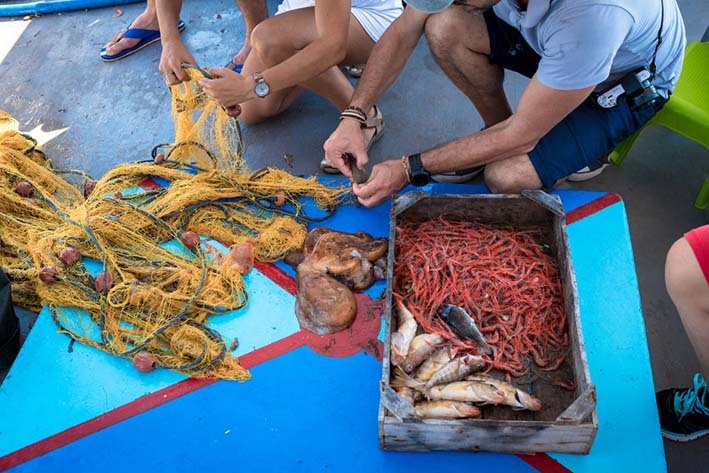 There two different tours equally nice one during lunch, Santorini: Traditional Fishing Trip and Fresh Fish Lunch and one during dinner, Santorini Sunset Fishing Trip with Dinner and Drinks. Skaros was a castle that used to protect Santorini from the pirates’ attacks in the 16th century. Now you cannot see that much from the castle but still, it is worth to pay a visit for the nice and unique views. 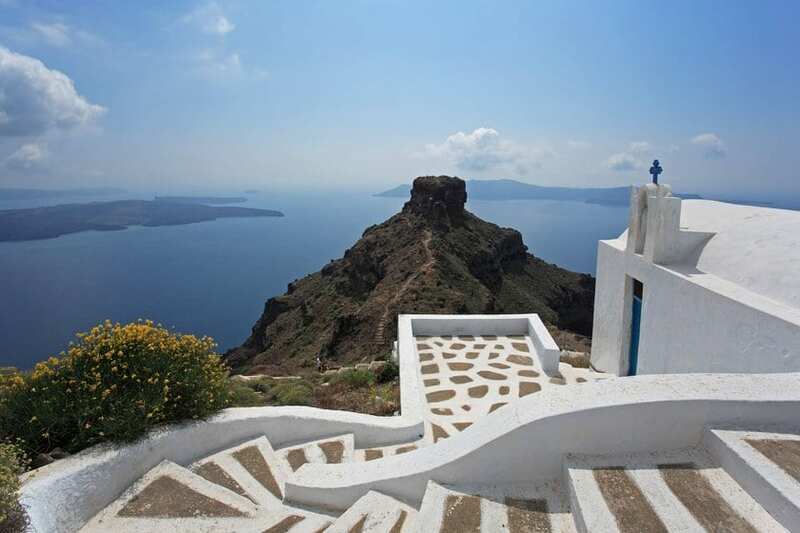 The path to Skaros begins from Imerovigli (there are signs ) and the 300 steps wouldn’t discourage you for visiting it! You can walk down the stairs from Oia to the Ammoudi Port (and then I am afraid you have to go up again for the stairs, as there is no bus) or drive through the road and park next to the bay. You can always call a taxi. Also, try to avoid taking the donkeys as there were some cruel events the past years and I think it is time to stop this cruelty. You can walk down the stairs to the Old Port, get a drink and get the cable car back up! It costs 6 euros and it quite a short route (3 minutes). You can, of course, walk up the stairs or get the donkeys, which personally I discourage as there are many cruel events in the past. It is well known in Greece that Santorini has the best fava dish! It is like hummus and you should try it! You will find it in all of the restaurants in Santorini in Greece. 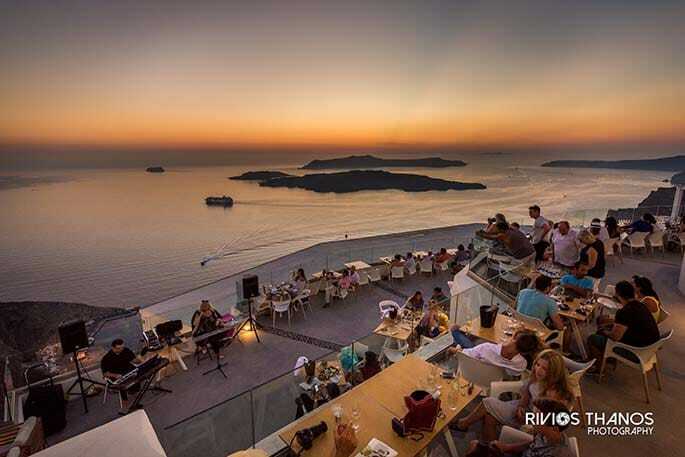 If you want to eat delicious food with an amazing view, then Santorini is the place! 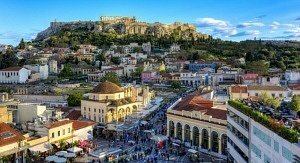 My favourite restaurants are the Athenian House, Steki tou Nikou, the Asterias and the Mezzo! If you don’t’ mind about the view then you can go to Lefkes, Terra Nera in Perivolos, Metaxi mas and Fistikies. Newer12 Best Hotels in Paros for 2019! 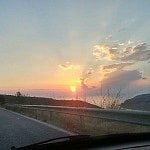 OlderThe best road trips in Greece!